Cookies can be useful when you’re in control of them. Today we’re taking a look at how you can control cookies by blocking them except for when you want them to enhance your user experience. A cookie is simply a small file that a web site places on your computer to store information. The process itself is totally benign, and can even be helpful—cookies do useful things like store your shopping cart information between sessions, save you from the hassle of logging into a site every time you open and close your browser, and other helpful time savers. 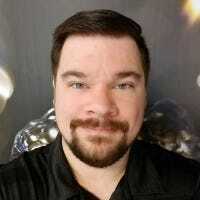 The ones that give cookies a bad name track users without their explicit knowledge and help advertisers (or other entities) build profiles of users. Many people want to limit the amount of information that is gathered about them, and do so by limiting the kind of cookies that their browser accepts and retains. Today, we’re going to look at some quick ways to do this is Internet Explorer, Firefox, and Chrome using whitelists. It’s much easier to specify which sites you want to accept cookies from than it is to perpetually accept and decline the hundreds of cookies your browser is bombarded with. As such, this is a rather aggressive approach to controlling cookies. We recommend it if you’re really serious about keeping your privacy on lock down and controlling what third-parties can track about your online behavior, or as a really great exercise in seeing just how many times web sites attempt to load your computer down with cookies. Internet Explorer has simple but serviceable cookie controls. There are two main areas we’re interested in: managing site status and toggling the cookie acceptance. First let’s look at how to whitelist a site. Click on Tools [the gear icon in the corner on newer versions] > Internet Options > Privacy > Sites. Here you’ll find the Per Site Privacy Actions menu, which allows you to white or black list web sites. Manually entering every site you’d like to whitelist is a bit on the kludgy side, so we’re going to semi-automate the process by toggling the cookie settings. Visit Tools [gear icon] > Internet Options > Privacy, and under Settings, click Advanced. Here, you’ll find a simple radio-button based menu where you can toggle the settings for first-party and third-party cookies. We’re going to temporarily turn on first-party cookie prompting and block third-party cookies. Rather than try to remember every site you might want to add to your white list, this allows you to accept the cookies on a need-to-use basis as they appear. After a few days of browsing, you’ll have likely come across nearly every site you regularly use and will be able to add them to the white list on an as-needed basis. At that point, you can toggle it to Block or leave it on Prompt if you don’t find it to be a nuisance. Unfortunately in the realm of extensions, IE is a lightweight, and there aren’t any widely adopted cookie management extensions. If you’re a die-hard IE user and unwilling to switch to Firefox or Chrome, one available option is No More Cookies, which allows you to bulk authorize and delete cookies in your IE cache. Compared to the native functionality, it’s not a radical improvement, but it’s mildly useful. Under “Accept third-party cookies,” select “Never.” You can also change the first-party cookie setting de-selecting “Accept cookies from sites”. 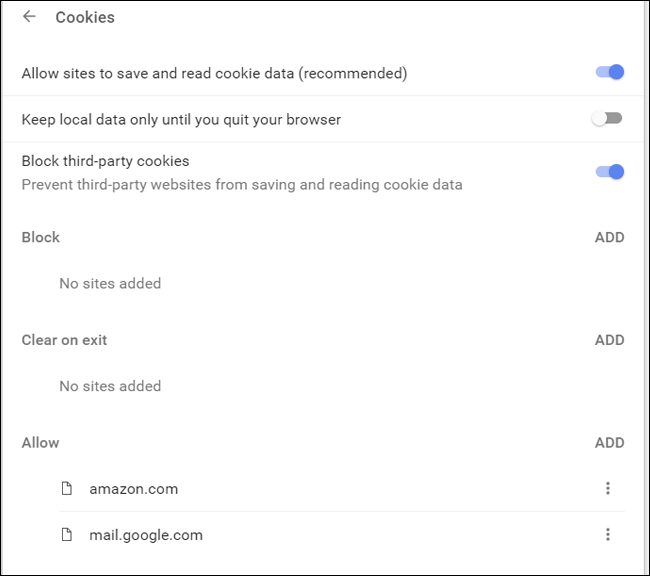 You can click the “Exceptions” button to manually add your most visited websites to the list, enabling them to store cookies for convenient logins and other settings. Just type the domain of the website and click “Allow” in this window to create the exception rule for the whitelist. You should be able to see which of your most visited sites really need cookie support after a week or two of regular browsing. If you want to really dig in and get your hands dirty, you can examine cookies on a cookie-by-cookie basis by click on the Show Cookies button found on the Privacy tab. There, you can get detailed information about cookies and manually delete them. Like Firefox, this window has toggles for all cookies (“Allow sites to save and read cookie data”) and third-party cookies (“Block third-party cookies.”) Chrome applies both of these settings universally, then lets you add exceptions that will always be allowed and always be blocked. 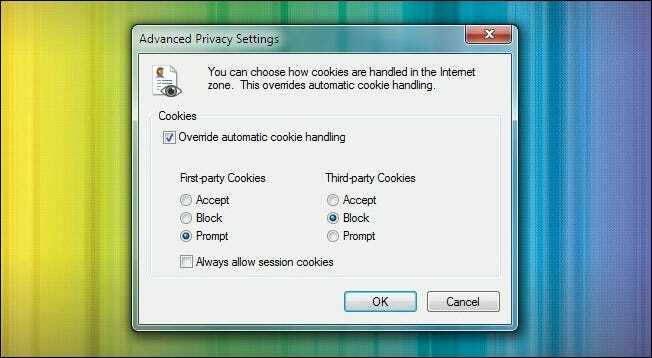 From this window you can set individual cookies or the entire site’s cookies to “Block” or “Allow.” This works best if you have all cookies blocked by default or third party cookies blocked, as otherwise the amount of tracking cookies on each page can overwhelm you in a huge list. To get to the main settings menu in Opera, click the “O” button in the upper-left corner, then click “Settings.” Click “Privacy and security” and scroll down until you see the “Cookies” sub-section. Exception controls open a new window that allows you to input individual sites to allow or disable cookies. Again, it should be pretty clear which of your commonly-visited sites need to be added to a white list after a week or two of browsing. If you’d like per-site cookie controls in Opera without having to dive into the Settings menu, try using the Policy Control extension. This add-on will let you enable or disable more or less all settings, including per-site cookie tracking, by clicking a single button on the menu bar. The settings will be saved and applied based on the current domain. Scroll down to the bottom again, and look for the drop-down menu under “Cookies.” Click the option for “Block all cookies” or “Block only third party cookies” according to your preference. Unfortunately, Microsoft hasn’t enabled a whitelist or blacklist option for Edge yet, and none of the officially-supported extensions do, either. If you need more granular controls of your cookies, you should choose from one of the better-supported options above.